Shop Clinique products at Cosmos stores located in Manhattan, Flushing, and New Jersey, and receive a free gift bag of selected cosmetic items! 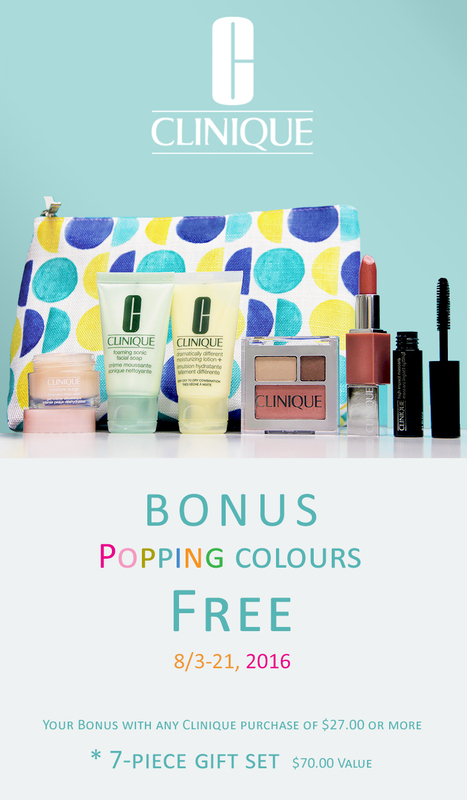 Cosmos teamed up with Clinique to give away free gifts for our valuable shopping customers. BONUS event presents a total of seven Clinique products for any cosmetic purchases over $27.00, a surprising mixture of new, and steady seller items worth value of $70.00, including Clinique Moisture Surge Extended Thirst Relief, which keeps skin moist from excessive sun exposure during summer season, marking as the must-have summertime essential item, and Dramatically Different Moisturizing Lotion +, well known for being the top leading moisturizing lotion, with its silky and smooth texture. The event starts on August 3rd and lasts until 21st, while same event rules applied in our 3 different store locations. A spacious, mod bag for all your on-the-go essentials. A hit of hydration to take you through the seasons: Oil- free cream- gel instantly rehydrates dry or dehydrates skin for 24 hours. Skin looks and feels younger, livelier. Turn your face wash into a facial with this creamy forming facial soap perfect for sonic cleansing. Oil-free. Millions start their day with this cult classic. Now you will, too. Lightweight lotion delivers all-day hydration and barrier strength. Makes skin more resilient. Eye shadow duo plus super-wearable blush in one can’t-buy-it-anywhere compact. Luxurious yet weightless formula merges bold, saturated colour with a smoothing primer. Glides on effortlessly to a modern-velvet finish. Kicks up the volume and length of each and every lash for a look that’s lusher, plusher, bolder. *Available only in limited quantities, first come, first served basis. *One Bonus to a client, please. While supplies last.